Every year I look forward to the Glastonbury Festival.This year we marvelled at the shortness of Lady Gaga’s dress (really, how did she not expose herself), wondered why people listen to Kasabian and decided to do something tenuously food related in honour of Bruce Springsteen*. Something quintessentially American. Something straightforward and honest, no nonsense, down to earth, but possessing a certain style and timeless appeal. Great, big, massive burgers. Nothing fancy, nothing elaborate, just a burger, in a bun with salad and a spicy relish. A huge piece of Americana on a plate. Many people claim to have invented the burger, but Charlie Nagreen of Wisconsin has the most plausible hold on that title. At the local fair in the town of Seymour in 1885, Nagreen had a stall selling meatballs. Business was slow, so he decided to shake things up a bit. He realised that people couldn’t really eat his meatballs and walk around the fair at the same time, so he squashed a couple of meatballs between two slices of bread, making his snacks portable and the hamburger was born. The ‘ham’ part comes from the original provenance of a ground beef patty as the ‘Hamburg steak’, a German idea dating from the eighteenth century. The hamburger gradually gained in popularity through the nineteenth and early twentieth centuries, becoming a diner staple, before receiving a huge kick start with the founding of McDonald’s. McDonald’s revolutionised the way in which hamburgers were produced, making the process slicker, more cost effective, and above all else, fast. Fast food, for better or for worse, was here to stay. These burgers aren’t fast food at all. They’ll take you at least three hours to make, if you do things properly. To start, the bread. A burger bun needs to be large, flat, floury and soft. A hard roll, or anything with a crust is no good here, neither is anything too sophisticated, like a ciabatta. A simple bread roll is what’s needed. Making a burger bun is easy. Start by weighing and sifting 450g of strong white bread flour. Add a generous tablespoon of olive oil or melted butter, two teaspoons of salt and a sachet of fast acting dried yeast. Add two teaspoons of sugar to 275ml of warm water and stir until the sugar is dissolved. Make a well in the flour and tip the warm water into it. Use a knife to gradually cut the flour into the water, until you get to the stage where a dough starts to form, then use your hands to form and knead the dough for a good five minutes, until it’s smooth and elastic. Cover and set aside for an hour or so until the dough has doubled in size. After the dough has risen, knock it back and knead it again for a minute, before dividing it into four equal pieces. Shape each piece into a round and place on an oiled baking sheet. Cover, and let the dough rise again for about half an hour. Bake in a hot oven (200c) for about twenty minutes. Next, the relish. A burger needs a little bit of fire, something to set it alight and lift it, something to make it tasty. A relish needs some heat, some chilli. The relish is easy. Cheat by opening a can of good quality chopped tomatoes, pour into a pan and add two finely chopped cloves of garlic, half a teaspoon each of ground cinnamon, cumin and coriander, a teaspoon of salt, a tablespoon of tomato puree, four or five chopped spring onions and a small red chilli, deseeded and finely chopped. Season with black pepper and let the sauce simmer, uncovered for half an hour. Add a handful of chopped parsley, or better still, coriander towards the end. The sauce is good hot or cold and will sit quite happily in the fridge for a few days. To the burger. I like my burgers to be substantial, to be a proper meal. 250g of the best beef I can find goes into each burger. They’re half pounders. Anything less is cheating, and it isn’t a proper burger. 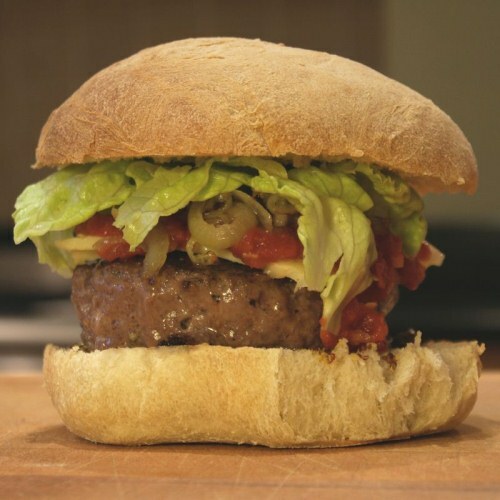 Hugh Fearnley–Whittingstall’s advice on burger making is simple and true – use the best quality beef you can, don’t add anything else, season just before cooking and just after, cook until still pink in the middle. Use a frying pan, not a griddle, and cook on a medium heat. That’s all there is to it. The exact composition and assembly of a burger is very much down to personal taste. I like mine to prompt comparisons to a Scooby snack. Add things like sliced tomatoes, lettuce, mayonnaise, wholegrain mustard, dill pickles, chutney, caramelised onions, etc. as the mood takes you. Serve with salad, chips, beer and The Boss. *For the record, I’m a latecomer to Springsteen, having grown up on a diet of indie, some grunge and a bit of hip-hop. I discovered Springsteen through The Killers, and now I’m hooked. Devils & Dust shows Springsteen at his poetic, political and enraged best, but my kids like The Seeger Sessions the best.